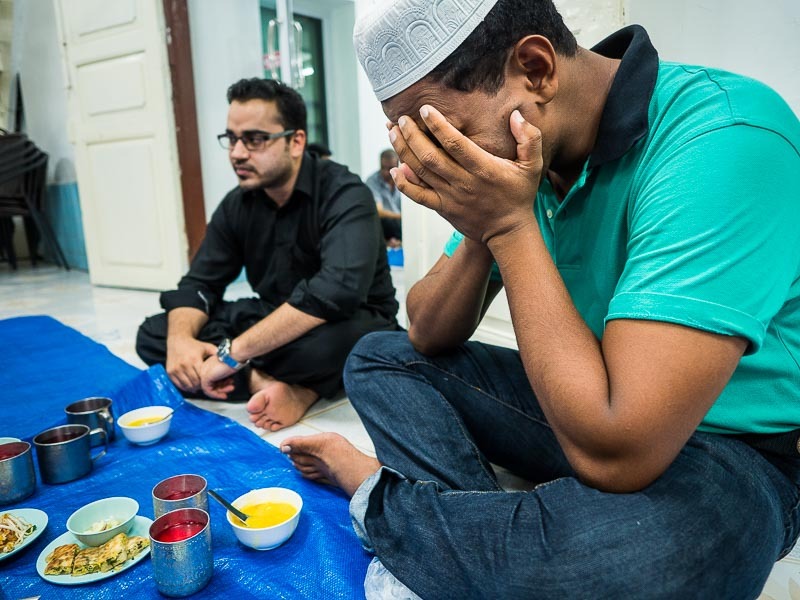 A man prays before breaking the Ramadan daily fast at Iftar at Haroon Mosque in Bangkok. 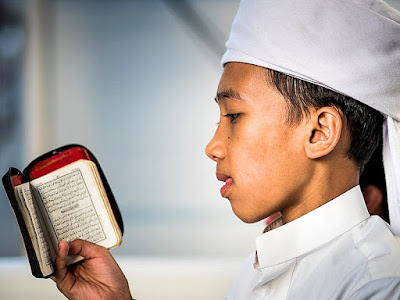 This is the holy month of Ramadan, when Muslims around the world fast during daylight hours to commemorate the first revelation of the Quran to Muhammad. Properly observing Ramadan is one of the Five Pillars of Islam. A boy reads the Qu'ran before the evening call to prayer. Iftar at Haroon Mosque is a community event. Even though it's a small mosque, it draws people from across Bangkok. The mosque was started by Javanese merchants in the 1800s. The mosque is close to the Chao Phraya River in a part of Bangkok that draws a lot of tourists. People at the mosque are used to strangers wandering through the community and treat them like honored guests. 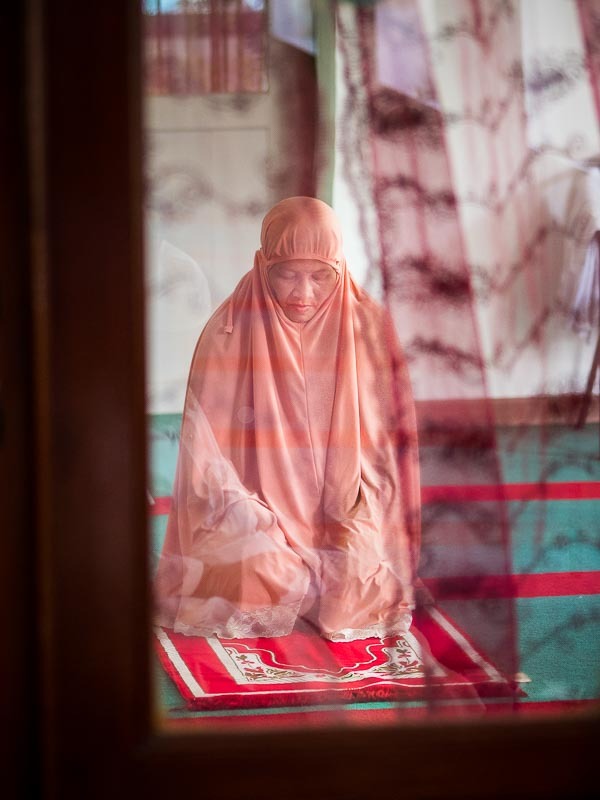 Seen through a lace curtain, a woman prays in the women's prayer room at the mosque. I like covering Iftar at Haroon Mosque. There are always a lot of people there, it's easy to strike up a conversation and people always invite you to dinner. It's really quite a remarkable gathering. And I'm no food critic, but the Iftar meal served at Haroon Mosque is some of the best Indian influenced food I've had in Thailand. The only challenge I have covering Iftar at Haroon Mosque is actually making pictures. Even though I am not Muslim, I'm inevitably invited to partake in Iftar. Breakfast is served before morning prayers, well before sunrise. Iftar is served around sunset. People have been fasting for nearly 14 hours. No food, and if possible, no liquids, including water. By the end of the day, they're hungry and thirsty and when the Iftar time arrives people eat. If I am eating with them (and it would be rude to refuse the invitation), I have about 1 minute to eat and start making pictures because the breaking of the fast takes just a couple of minutes before people go back into the mosque for prayers. There are more photos of Iftar in my archive or available from ZUMA Press.